Situated in a great location just off of Alta Vista drive on a quiet cul-de-sac yet only one block to groceries and shopping. Very unassuming from the street this home offers much much more than meets the eye. Great for the adult couple who likes to have enough space so that they can enjoy their times together yet each have their own space as well. Nearly 1950 square feet of very comfortable living space. An expansive two-storey addition was added in 1997 to the back of the home. The addition was designed to carefully flow up from the existing roofline allowing the front of the home to retain the bungalow look in keeping with the neighbourhood and era. Click here to view the Photo Gallery or Here to View the Video on YourTube! Professionally designed by Gerhard Linse, the custom addition includes an expansive new foyer and massive Family Room with cozy heated ceramic flooring and a Luxury Master Retreat on the second floor. Everything but the Master Retreat is conveniently located on the main floor, including Eat-In Kitchen, massive Dining Room, second Bedroom, full Bathroom and the former Living Room which works great as a bright Den/Office or perhaps even a guest Bedroom easily separated for privacy with French doors. Unique to Ottawa this home has what is common to houses south of the border – absolutely no basement. This means you’ll never have to worry about leaky or damp basement issues or digging up foundations to reseal or fix cracks. Another plus is that the laundry room is by default on the main floor with everything else. If you’re thinking that you’ll be missing storage space, think again, as the complete walk-in upper attic space ( 37′ by 10′ ) will store everything you need high and dry. Durable flooring finishes in cork, ceramic and hardwood make this home superb for people with allergy or environmental sensitivities. As the owner you’ll enjoy beautiful light filled spaces, overlooking a beautiful large property complete with new deck, with roll-out awning, perennial gardens, and wood/garden shed ( which fits a kayak or canoe ) and a heated workshop. No rear neighbours means lots of privacy to enjoy your piece of Ottawa. Everything has been thought of to make this home as maintenance free as possible while providing all the comforts. Central Vac, Central Air, Heated flooring in the Living/Great Room, on-demand Hot water, Gas BBQ Hookup, even gas feed behind the wall in great room should you desire to add a fireplace. The double carport added in 2007 offers space for two cars, and thoughtfully included skylights to retain the natural light flowing into the house. Completely ready for your arrival with so many recent upgrades and thoughtful additions, including high efficiency gas furnace, heated workshop added in 1991, house clad in insulation and vinyl siding in 1992, 2-storey addition in 1997, vinyl windows with u/v filter and shatterproof film on all rear main windows and doors, deck replaced and expanded in 2005, carport added 2007, on-demand hot water added 2010, roof on original house redone in 2010, laneway repaved 2011. Where else can you live and enjoy a quiet neighbourhood lifestyle on one of Ottawa’s most popular areas yet still walk to virtually every amenity. Park your cars in the carport as you’re just steps, from groceries, pharmacy, banks, restaurants including Cora’s famous breakfast place. And also if you’re working downtown your just minutes away whether by car or transit. For a non-downtown location this location has an amazing walk-score of 78 out of 100 – according to walkscore.com – check out the map below to see what you walk to! Truly a one of a kind home and rare opportunity – Click on the attachment below to see the room sizes and details. Call Eric Manherz today at 613-601-6404 to find another great property for you! Click on the attachments below to see the property details and large list of upgrades. 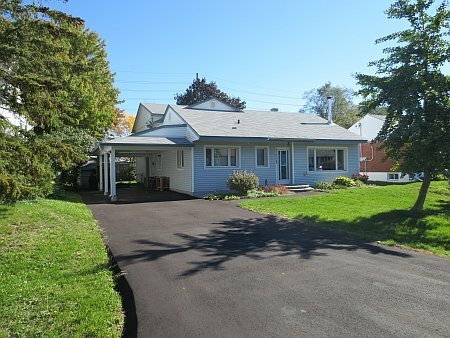 Walkscore of 78 out of 100 for 2663 Ayers Avenue in Ottawa.